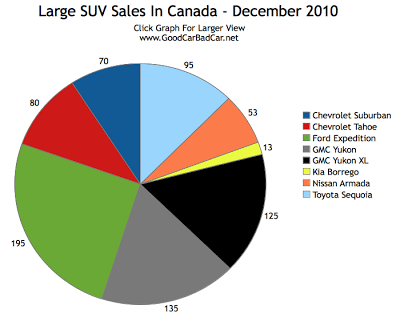 General Motors Canada failed to sell their large sport-utility vehicles at the same rate as in December 2009 but still came out on top as the market share leader in the jumbo SUV segment. Chevrolet Suburban sales were down 67.7%, Chevy Tahoe sales fell 25.2%, GMC Yukon sales dropped 60%, and the GMC Yukon XL’s 108% gain only brought back 65 of the 377 sales lost by its three compatriots. Ford Expedition sales were up in December, as were sales of the Nissan Armada and Toyota Sequoia. GM’s large SUV market share was a truly strong 53.5% in December 2010, but that’s down from 69.4% in December 2010. 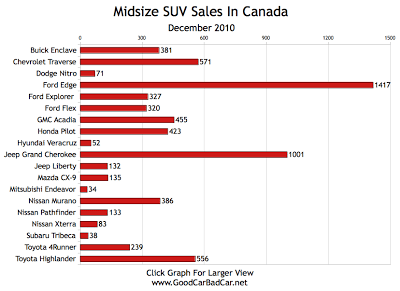 The midsize SUV sales chart has been changed for December 2010 to show individual sellers where once company heads were named. 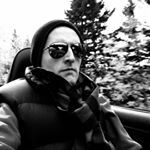 Thus, GM’s Lambda triumvirate fails to display its 1407-unit might, as the Buick Enclave, Chevrolet Traverse, and GMC Acadia are split up. 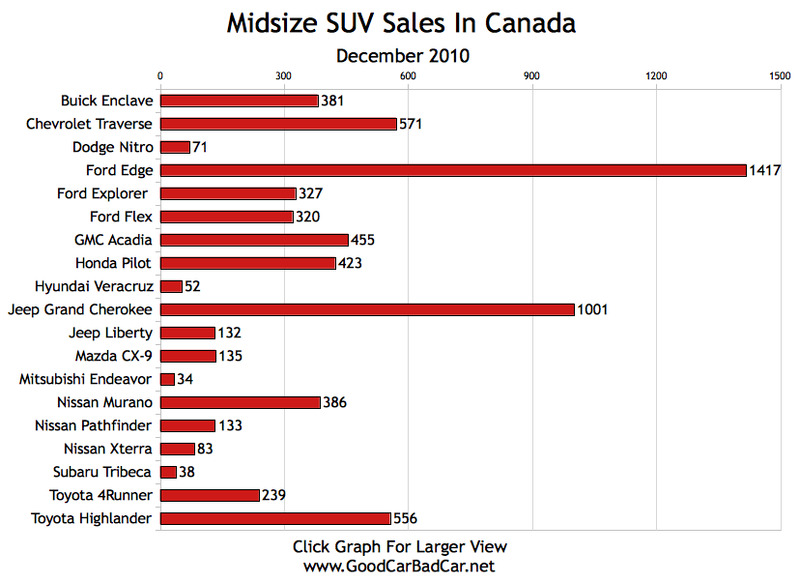 All three, by the way, posted declining sales compared with December 2009. The 2011 Ford Edge, Lambda’s lone conqueror, was up 22.8%. Chrysler Canada’s still-new 2011 Jeep Grand Cherokee was up 26.4% but could – perhaps – see another challenge from the Blue Oval once the 2011 Ford Explorer catches on. Explorer sales were down 15.9% in December 2010. Once two of the most famous names in SUV history, the Grand Cherokee and Explorer graducally slipped into relative oblivion as car-based crossovers took over. Now the Grand Cherokee is more refined than ever; the Explorer can be had with front-wheel drive; and neither ute is much of a truck. Both should put up sales figures in 2011 that far outweigh what either could muster in 2010. Anything less would be a serious disappointment.